I make it a point that during my field season I enjoy my breakfast out on the deck. It is situated about halfway up the canopy of the surrounding forest and offers a unique perspective that is hard to come by elsewhere. Instead of looking up at the trees, I am situated in a way that allows for a better understanding of the overall structure of the forest. Its this perspective that generates a lot of different questions about what it takes to survive in a forested ecosystem, especially as it relates to sessile organisms like plants. Quite possibly my favorite plants to observe from the deck are the pagoda dogwoods (Cornus alternifolia). Hinted at by its common name, this wonderful small tree takes on a pagoda-like growth form with its stacked, horizontal branching pattern. It is unmistakable against the backdrop of other small trees and shrubs in the mid canopy. The fact that it, as well as many other plant species, can be readily recognized and identified on shape alone will not be lost on most plant enthusiasts. The fact that diagrams like these exist in tree guides is proof of the utility of this concept. Even without the proper vocabulary to describe their forms, anyone with a keen search image understands there is a gestalt to most species and that there is more to this than simply fodder for dichotomous keys. The overall form of plants has garnered attention from a variety of disciplines. Such investigations involve fields of study like theoretical and quantitative biology to engineering and biomechanics. It has even been used to understand how life may evolve on other planets. It is a fascinating field of investigation and one worth spending time in the literature. Some of the pioneering work on this subject started with two European botanists: Dr. Francis Hallé and Dr. Roelof Oldeman. Together they worked on conceptual models of tree architecture. 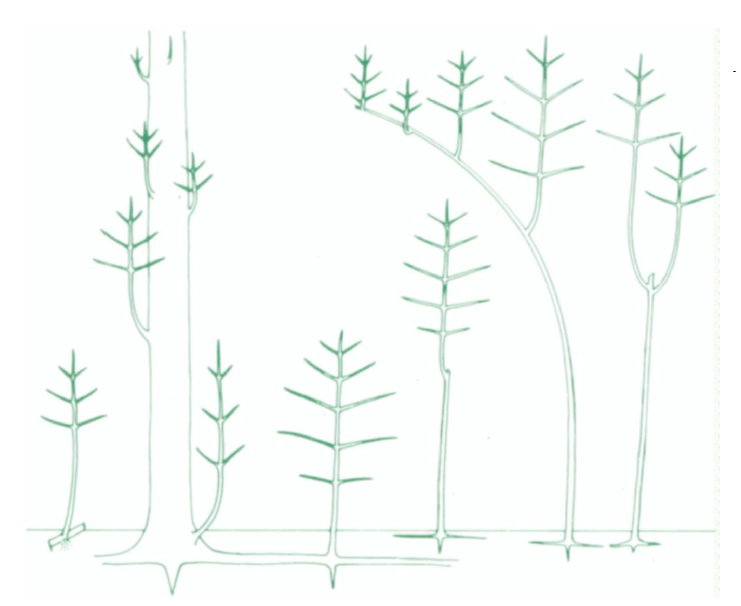 Using a plethora of empirical studies on whether a tree branches or doesn't, where branches occurs, how shoots extend, how branches differentiate, and whether reproductive structures are terminal or lateral, they were able to reduce the total number of tree forms down to 23 basic architectural models (pictured above). Each model describes the overall pattern with which plants grow, branch, and produce reproductive structures. At the core of these models is the concept of reiteration or the repitition of form in repeatable sub-units. The models themselves were given neutral names that reflect the botanists that provided the groundwork necessary to understand them. Despite the fact that these models are based on investigations of tropical tree species, they are largely applicable to all plant types whether they are woody or herbaceous and whether they occur in the temperate zone or the tropics. The models themselves do not represent precise categories but rather points on a spectrum of architectural possibilities. Some plants may be intermediate between two forms or share features of more than one model. It should also be noted that most trees conform to a specific model for only a limited time period during their early years of development. Random or stochastic events throughout a trees life greatly influence its overall structure as it continues to grow. The authors are careful to point out that a trees crown is the result of all the deterministic, opportunistic, and chance events in its lifetime. Despite these exceptions, the adherence of most plants to these 23 basic models is quite astounding. Although many of the 23 models are only found in the tropics (likely an artifact of the higher number of species in the tropics than in the temperate zones), they provide accurate reference points for further study. For instance, the restriction of some growth forms to the tropics raises intriguing questions. What is it about tropical habitats that restricts models such as Nozeran's (represented by chocolate - Theobroma cacao) and Aubréville's (represented by the sea almond - Terminalia catappa) to these tropical environments? It likely has to do with the way in which lateral buds develop. In these models, buds develop without a dormancy stage, a characteristic that is not possible in the seasonal climates of the temperate zones. Reiteration is an important process in plant architectural development in which plants repeat their basic model. This is especially important in repairing damage. Another interesting finding borne from these models is that there doesn't seem to be strong correlations between architecture and phylogeny. Although species within a specific genus often share similar architecture, there are plenty of exceptions. What's more, the same form can occur in unrelated species. For instance, Aubréville's model occurs in at least 19 different families. Similarly, the family Icacinaceae, which contains somewhere between 300 and 400 species, exhibits at least 7 of the different models. Alternatively, some families are architecturally quite simple. For instance the gymnosperms are considered architecturally poor, exhibiting only 4 of the different models. Even large families of flowering plants can be architecturally simplistic. Take the Fabaceae, which is largely comprised of plants exhibiting Troll's model. So, at this point the question of what is governing these models becomes apparent. If most plants can be reduced to these growth forms at some point in their life then there must be some aspect of the physical world that has shaped their evolution through time. Additionally, how does plant architecture at the physical level scale up to the level of a forest? Questions such as this are fundamental to our understanding of not only plants as organisms, but the role they play in shaping the world around us. 1) Plants have to capture sunlight and avoid shading their own leaves. 2) Plants have to support themselves structurally. 3) Plants have to conduct water to their various tissues. 4) Plants must be able to reproduce effectively. Using these basic constraints, Dr. Niklas built a mathematical simulation of plant evolution. His model starts out as a "universe" containing billions of possible plant architectures. The model then assesses each of these forms on how well they are able to grow, survive, and reproduce through time. The model is then allowed to change environmental conditions to assess how these various forms perform and how they evolve. An example of Niklas' model showing how simple branching pattern (bottom) can evolve over time into more complex, yet familiar, forms (top). The most remarkable part of this model is that it inevitably produces all sorts of familiar plant forms, such as those we see in lycophytes, ferns, as well as many of the tree architectural models mentioned above. What's more, later iterations of the model do an amazingly accurate job at predicting forest structure dynamics such as self-thinning, mortality, and realistic size/frequency distributions of various species. It would appear that the rules governing what we know as a plant are to some degree universal. Because constraints such as light capture and the passive movement of water are firmly grounded in the laws of physics, it makes sense that the successful plant architectures we know and love today (as well as those present through the long history of plant evolution on this planet) are in large part a result of these physical constraints. It also begs the question of what photosynthetic life would look like on other planets. It is likely that if life arose and made its living in a similar way, familiar "plant" architecture could very well exist on other planets. Listen to my interview with Dr. Karl Niklas here.